My neck and right shoulder were really bothering me, especially on days when I spent a lot of time on my computer. That’s when I finally decided to seek professional help and get an ergonomic assessment from Dr. Jackie Casab. “What kind of computer do you use?” she asked. 1. Trash your stylish mouse. Put the palms of your hands flat on your keyboard. This is called pronation. It’s an unnatural position for your hands and wrists. Now put your palms together. This is a natural position for your hands. It should feel better. Are you attached to your mouse much of the day? If so, use a mouse that requires as little pronation as possible. Pronation causes irritation to all your wrist and arm muscles. It can be especially irritating if you rest your wrist on your computer or desktop. Your chances of causing carpal tunnel syndrome, radial tunnel syndrome, extensor tendonitis or rotator cuff tendonitis are all increased. If you mouse a lot, trade your stylish mouse in for one that’s more ergonomic, such as the Anker wireless vertical ergonomic optical mouse. 2. Make sure your arms are as close to your side as possible. When you hold your arms out too far, you put stress on your rotator cuffs. This is most likely to happen with your dominant mousing arm. Use a keyboard without a 10-key pad on the right side of the keyboard. Alternate your mouse back and forth equally between your dominant and non-dominant hand. Only about 1 in 100 people are ambidextrous. If you’re one of them, this solution may work well, but if not, just realize there can be a learning curve involved. Add a Humanscale keyboard with a clip mouse to your desktop so that you can adjust your keyboard and mouse for custom support and comfort. 3. Relax the angle of your elbows. Keep the angle of your elbows between 100-120 degrees. If you don’t, you’ll constrict nerves causing increased muscle tightness and irritation which leads to some of the symptoms such as muscle ache or elbow pain that may be construed as carpal tunnel. How not to sit when working at a computer. See how the angles formed by the joints in her arms, legs and hips are too small. 4. Sit straight with your shoulders rolled back and down. When you lean toward your computer, you automatically hunch your back. This increases the tension and irritation in your shoulders. When your shoulders roll forward, you’re automatically raising them. This tightens the muscles along the tops of the shoulders and increases symptoms such as lower neck pain, fatigue, headaches and other common stress symptoms. Next time you feel stressed at your desk, lean back and relax your shoulders. It will go a long way in helping to reduce the tension in your body. 5. Relax the angles of your lower body. Have a slight downward angle in your seat so that your hips form an angle that’s greater than 90 degrees. Let your feet sit flat on a surface below your chair. Your knees should be at an angle of 90-100 degrees. Your knees work the same as your elbows. If you close the angle too much, it causes constriction of your nerves and blood flow. This can lead to decreased blood flow throughout your lower limbs which may make you feel cold. It can also cause muscle tightness or cramping. 6. Hold your head up and back. Dropping your head angle more than 30 degrees is considered excessive flexion of the neck. This increases the tension across the top of your shoulder and in the muscles in the back of your skull. It also greatly increases your chance of sprain, strain, fatigue and the likelihood of getting tension headaches. 7. Make sure your eyes land in the upper third of your screen. Make sure your main screen is sitting high enough so that when you’re looking straight out, you’re looking at the upper third of the screen. This works easiest if you have a second screen at your desktop or a detached keyboard. If your desktop is high, use a keyboard on your lap. Choose a tent keyboard or one with a bit of an ergonomic wave, such as the Microsoft natural ergonomic keyboard. 8. Use the 20-20-20 rule. Look 20 feet away for 20 seconds every 20 minutes when working on a computer. One of the reasons people have sight problems is that their eyes get fatigued from staring at screens too long. When you look at least 20 feet away it allows your eye muscles to completely relax. This decreases your amount of eye fatigue and your chances of vision degeneration. Set a timer to help you remember to do this every 20 minutes or download a 20-20-20 app. But what if you work in an office with no window? Plan reasons to get up: take a bathroom break, walk to lunch, take a water break, walk while you’re taking a phone call, schedule meetings outside your office. Keep your eyes and your body active throughout your workday. 9. Get up and move at least once an hour. 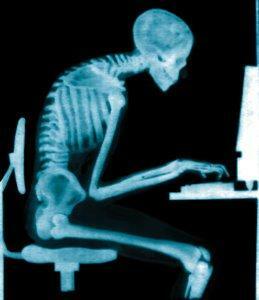 If you sit too long, the ligaments in your back and spine start to stretch. They’re like rubber bands. Over time, they can’t recoil as easily. This can cause instability and lower back pain. A lot of people resort to pain medications, anti-inflammatories or muscle relaxants which mask the symptoms. But because these drugs don’t solve the problem, their physical condition continues to go downhill. Get up every hour to do some stretches, even if you work in a cubicle. If your concerned about the cost of purchasing products to support good ergonomics, be sure to ask your employer. In many cases companies will pay for these tools. In the long run, they’ll have more satisfied employees with fewer sick days. For more information on employer responsibilities and worker rights on ergonomics, see the OSHA guidelines for prevention of musculoskeletal disorders in the workplace. You don’t need to change everything at once. It takes time to adjust to new habits. There’s a bit of a physical learning curve. It’s better to make small adjustments over time until you reach a point of feeling comfortable at the end of each workday. After the initial adjustment with Dr. Jackie, I felt a lot of relief in my neck and back. In the following days, I also began to incorporate her recommendations in my home office and I started feeling immediate benefits. “Be proactive and health will follow,” Dr. Jackie says. After years of unexplained spasms and back pain, chiropractics gave Dr. Jackie relief she hadn’t felt in years. And it all happened practically overnight! Her personal experience, along with the amazing benefits that chiropractics had on her horses prompted her to pursue a career as a chiropractor. 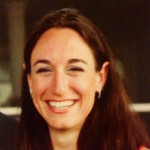 She earned her Doctor of Chiropractic degree from Palmer College of Chiropractic. “That sense of how amazing the world can be when things are working correctly in our bodies is what I want to return to all my patients,” says Dr. Jackie. If you’re experiencing symptoms of stress and overall tension at the end of each workday, call or text Dr. Jackie Casab at 408-372-8469 for an adjustment and personal ergonomic assessment at Casab Sports & Wellness Chiropractic. “In addition to these tips, there are many other solutions to consider such as: foot rests, document holders, chair ergonomics, desktop height, rounded edges on desks and more,” says Dr. Jackie. So I started looking for a new office chair. Next time I visit Dr. Jackie, I’d like to get her opinion on the Hawaii Hula chair. 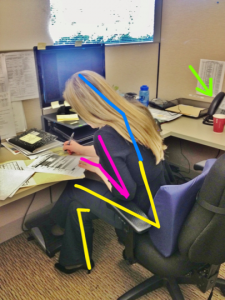 This is some really good information about ergonomics and how to improve it. I liked that you pointed out that getting up and moving around will help you recover faster. I had no idea that will help with plastic surgery. My mother has been thinking about getting some work done, so that is good for her to know.